James T. Patterson, historian at Brown University, discusses the end of the 20th century, focusing on the changes in the United States from Watergate to Bush v. Gore . The Our Constitution book, written by Donald A. Ritchie and JusticeLearning.org, takes an in-depth look at the Constitution, annotated with detailed explanations of its terms and contents. Included are texts of primary source materials, sidebar material on each article and amendment, profiles of Supreme Court cases, and timelines. The complete book or individual chapters can be downloaded. Locate primary sources from the holdings of the National Archives related to such topics as “checks and balances,” “representative government,” all 27 amendments, and other concepts found in the Constitution. 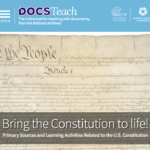 This special home page devoted to the U.S. Constitution also features activities to share with students, such as “The Constitution at Work,” which uses primary sources to demonstrate the Constitution in action in our everyday lives. Discover what inauguration ceremonies over the centuries can teach us about our changing nation and the leaders who have shaped it. Taking a close look at the moments in which these leaders first took office can provide rich opportunities to investigate the history of the United States as it has changed over the centuries. It can also provide unique insights into these remarkable individuals as they first stepped into history. The Constitutional Index breaks down the U.S. Constitution by Section, Amendment, and Clause and contains broader topics and themes. These are used to cross-reference Library resources in an effort to annotate constitutional history.